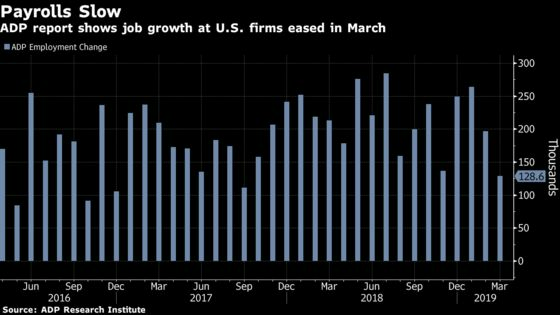 U.S. companies added the fewest workers in March since late 2017 as construction and manufacturing cut jobs, according to a private report that signals potential weakness in employment ahead of the monthly Labor Department data Friday. Private payrolls increased by 129,000, missing economist estimates, after an upwardly revised 197,000 gain in February, according to data released Wednesday by the ADP Research Institute. Goods-producing jobs shrank for the first time since December 2016. The downshift in hiring signals the labor market is taking a breather amid headwinds from slowing global growth, an unresolved trade battle, the waning effect of the tax cuts and a shrinking pool of job candidates. The figures may fuel some pessimism for the monthly jobs report, though economists project that the data will show payrolls bounced back from a weak reading to one more in line with recent trends. Goods-producing jobs shrank with a 6,000 drop in construction, the steepest drop since 2012, and a 2,000 decline in manufacturing, the biggest decrease since 2016. Service providers expanded by 135,000 -- the least in four months -- led by education and health services and professional and business services. The report pointed to strains at the smallest businesses. Firms with fewer than 20 workers shed almost 9,000 jobs for the first back-to-back drop in eight years. Economists in Bloomberg’s survey had forecast the main gauge easing to 175,000. ADP’s payroll data represent about 411,000 firms employing nearly 24 million workers in the U.S.